Here is an interesting and very unusual item. 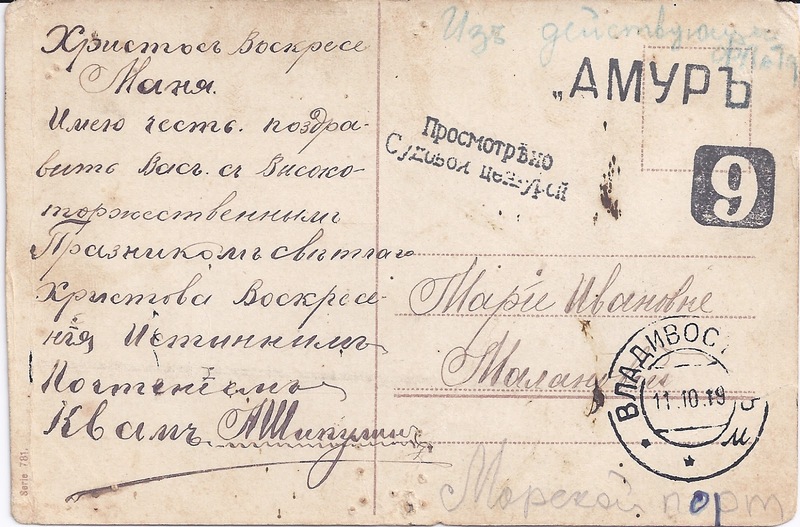 It's banal picture postcard, posted On Active Service - the Russian equivalent of that is written at the top of the card in blue-green. 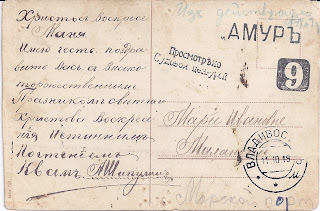 Though it has an 11 October 1919 Vladivostok postmark, the message begins with the traditional Easter greeting, Christ is Risen! But this seems to be used as a joke to refer to the fact that it is someone called Christopher's birthday. The recipient obviously liked the card which is full of holes from having been pinned up repeatedly. Now to business: the card was posted on board ship, where it was subjected to naval censorship indicated by the small two-line cachet above the handwritten address. This cachet reads EXAMINED /BY NAVAL CENSORSHIP. But where? Dr Raymond Casey comes to my assistance: the large "AMUR 9 is the (probably) incomplete strike of a slightly larger cachet, probably with a second pair of inverted commas after "Amur and maybe another letter or number. It is the personal cachet of the censor, struck in the same ink as the two-line general Naval Censorship handstamp, and it identifies the ship on which the card was posted. The Amur (and here all the information is from Dr Casey) was a minelayer built in 1907, a vessel of 3068 tons with a full complement of 318 sailors which was based for the duration of World War One at Vladivostok. In 1919 it was presumably under White (Admiral Kolchak) control. A puzzle remains: the address as written in ink looks incomplete - it is just someone's name. But at the base of the card, in a childish hand is written in pencil, partly inked over, "Morskoi port" - which means no more than "Sea Port" but might be sufficient to identify where the card should go in Vladivostok. Alternatively, it is a later addition to the card, made for unknown reasons. Can anyone illustrate another example of the AMUR cachet - or provide an image of the ship?